Jonathan Alder’s Jackson Izzard (5) looks to pass the ball in this file photo. Izzard scored 16 points on Tuesday as the Pioneers defeated Franklin Heights. Jackson Izzard scored 16 points on Tuesday as Jonathan Alder’s boys basketball team topped Franklin Heights, 42-30, in non-conference action. Izzard was joined in double figures by Henry Walker, who tallied 12 points. 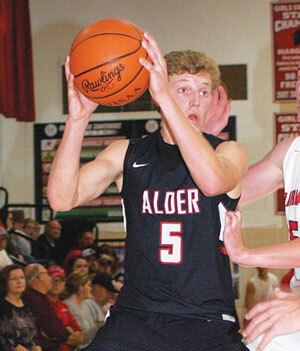 Alder, which will host Bellefontaine on Friday, broke a 9-9 stalemate after the first quarter by limiting the Falcons to four points during the second period. The Pioneers (2-0) took an 18-13 lead at halftime and a 28-22 margin into the fourth stanza. Izzard 5-4-16, Walker 6-0-12, Heinig 1-4-6, Santa-Emma 2-1-5, Stevens 1-0-3, Koenig 0-0-0, Zuro 0-0-0, Begin 0-0-0. Totals 15-9-42. Three-point goals: Izzard 2, Stevens 1. Banks 4-0-9, Fofana 3-1-7, Barker 1-3-5, Saunders 1-0-3, McDonald 1-0-2, Johnson 1-0-2, Garrard 1-0-2. Totals 12-4-30. Three-point goals: Banks 1, Saunders 1. Triad’s boys cagers tipped off the season with a 69-47 loss to Graham. The Falcons jumped out to an 18-9 lead by the end of the opening set and took a 33-24 margin at halftime. Graham poured in 24 points during the third quarter and held a 57-33 advantage going into the fourth period. Austin Bails was the lone Cardinal in double figures with 11 points. The Cardinals will travel to West Liberty-Salem on Friday. Bre. King 9-2-22, Bra. King 8-3-19, Adams 5-0-14, VanScoy 3-0-6, Palmer 1-1-3, Miller 0-3-3, Flora 1-0-2, Black 0-0-0, St. Meyers 0-0-0. Totals 27-9-69. Three-point goals: Adams 4, Bre. King 2. Bails 4-0-11, Nott 4-0-9, Oyer 2-1-6, Bundy 2-0-6, Campbell 2-1-5, Simonelli 1-0-2, Lease 1-0-2, O’Neal 1-0-2, Carson 1-0-2, Walls 1-0-2, Thompson 0-0-0, Overholser 0-0-0. Totals 19-2-47. Three-point goals: Bails 3, Bundy 2, Nott 1, Oyer 1. Marysville’s eighth-grade Blue Lady Monarchs improved to 4-0 with a pair of victories in the past week. Bunsold played at Dublin Karrer on Thursday and claimed a 39-18 win. Madison Lim led Marysville’s scorers with 10 points, while Ava Krutowskis added eight. Bunsold hosted Dublin Grizzell on Tuesday and came through with a 35-26 triumph. Cam Lee and Leah Brown each had 10 points, while Brown led the team in defensive rebounds. The Lady Monarchs will travel to Dublin Davis on Thursday. The Bunsold Red girls hoopsters downed Hilliard Heritage, 36-7, on Tuesday. In doing so, the Lady Monarchs improved to 3-0. Reagan Cotner tallied 12 points, while Reagan Traucht scored 10 and Paige Thallman added eight.